Neale’s Disorders of the Foot remains the essential resource for students and practitioners of podiatry. All the common conditions encountered in day-to-day podiatric practice are reviewed and their diagnoses and management described along with areas of related therapeutics. 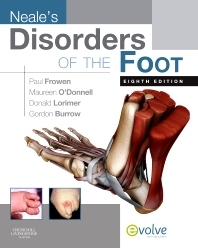 Students will find in this one volume everything they need to know about foot disorders and their treatment in order to pass their examinations, while practitioners will continue to appreciate the book’s accessibility and relevance to their daily practice. The new eighth edition is more indispensable than ever before with all contributions revised and brought up to date, colour photographs throughout, an all-new clear and accessible full colour design, and its own website including a full image library, video clips of key techniques and interactive self-assessment questions. Whether you need quick reference or more detailed information, the new and improved Neale’s Disorders of the Foot is ready to serve the needs of a new generation of podiatry students and practitioners.